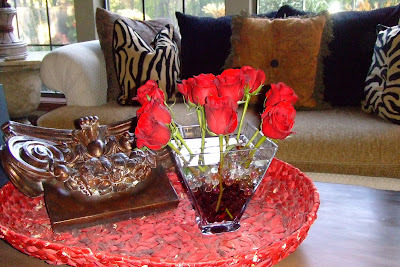 My husband brought home a dozen red roses for me yesterday. What fun to get flowers when you least expect it. I've always thought that getting flowers is the most romantic thing ever - of course what girl wouldn't think that. My husband knows that I tend to rebel against the idea of men having to give flowers/gifts on days they are expected to like valentines day, birthdays, etc. I've always excused him from buying me flowers on days like these and even told him NOT TO. That's why these flowers were very special to me because they weren't expected. Makes the gift even more valuable to me and shows me that he's hearing me....now that's even more romantic than the flowers, you think? My birthday is on Saturday so you see....he did it right. I know what you are thinking..... we woman are so complicated, but.... I'm glad I've got a man that understands and keeps the romance going after 20 years of marriage. Hats off to you Dan, you are a keeper. I've had this fun shaped glass vase for about 2 months now and I finally got to put some flowers in it. I filled the base with glass marbles - a layer of red at the bottom and then white at the top. The glass marbles keep the flowers upright. Simple, classy and beautiful. Love is a good thing, especially when it involves roses.